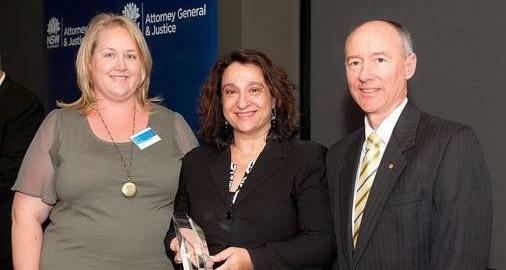 We were delighted to learn recently that the Information Services Team at the NSW Crown Solicitor’s Office won an Award for Innovation at the Department’s Annual Achievement Awards. In 2011, Maria Kepreotes and her Information Services team, in conjunction with IT and the Training units and technical developer KRECS, developed an email integration tool, called KMail. This tool enabled CSO staff to seamlessly capture email into their electronic document and records management system (EDRMS), bringing efficiency and cost savings. Staff at the CSO were finding it increasingly challenging to deal with the increase in business emails, replacing traditional forms of communication with their clients. Registering emails into the EDRMS was a relatively complex task and increased administrative overheads. Email inboxes were increasing exponentially in size. The Information Services Unit, in collaboration with other internal units (IT, Business Services and Training), looked for a solution to address these issues. They needed to reduce the time it took to register emails and the size of mailboxes but still enable compliance with recordkeeping obligations and business needs for information. The development team realised that they would also require a comprehensive training program to encourage positive organisational change. They had the full support of the CSO Executive which enabled them to fully investigate and address the problem. In collaboration with a supplier, they developed a technical solution: a tool known as KMail. KMail enables staff to drag and drop their email into folders. When this is done, the emails will automatically register into TRIM. Instead of taking over a minute to register each email, users can now register in a matter of seconds. When registered, the email can be deleted from the inbox, reducing mailbox size. The training program has also guaranteed wide staff involvement and support. KMail has exceeded all expectations, reducing the staff time required to register emails by 92%. It is expected that the solution will lead to a 45% reduction in email inbox sizes. Since KMail was introduced there has also been a massive increase in the number of emails registered into the EDRMS, improving compliance and ensuring that all relevant information about a matter is captured and available to the business. Time saved performing administrative tasks has enabled staff to focus on the provision of legal services. The team are listening to their users and continue to improve the KMail product to deliver further benefits to the business. For example, a new update has been implemented to allow solicitors to register email where contacts are not known. The Marketing Manager from the CSO approached Maria and recommended that she put forward a nomination for the Department’s Annual Achievement Awards as she was impressed with the KMail solution and the business benefits it created. The Director General presented the team with the award on 6 December 2011. The staff at State Records would like to extend our congratulations to Maria and her team for this innovative solution and well-deserved award! « Our top 5 – Why recordkeeping is awesome!